Gain their attention: Call the person by name to attract their attention or a gentle touch may help. Wait to talk until the person knows you are trying to talk with them. Depending on their age this might take a moment for them to acknowledge you are going to speak with them. Face each other: They need to see your face clearly your facial expression help guide them with what you are saying. Hearing impaired get really good at reading lips and most of the time they don’t even know they are reading lips. Keep your hands away from your mouth so they can see your lips clearly. Talk normally: Keep your face uncovered and in clear sight. You will want to talk in a normal voice, maybe slower and enunciate each word individually. Don’t speak each word by itself like they don’t understand the word. You just don’t want to slur the words together. Don’t exaggerate lip movements, just move lips normally. Shouting can distort the hearing aid or make your voice higher pitch ultimately making it harder to hear. You can also try talking in a deeper voice this can help for some. Rephrase: Sometimes people lose some of their understanding of words so, they might have heard you but did not understand you. If you said something in a language I did not understand I heard you I just have no idea what you said. By rephrasing they might be able to understand what you said better. Remember: Hearing impaired get tired of asking people to repeat as much as the speaker gets tired of being asked to repeat. So, they will often smile and nod without know what they are smiling and nodding to. To know if they understand ask them to repeat back to you what was said. 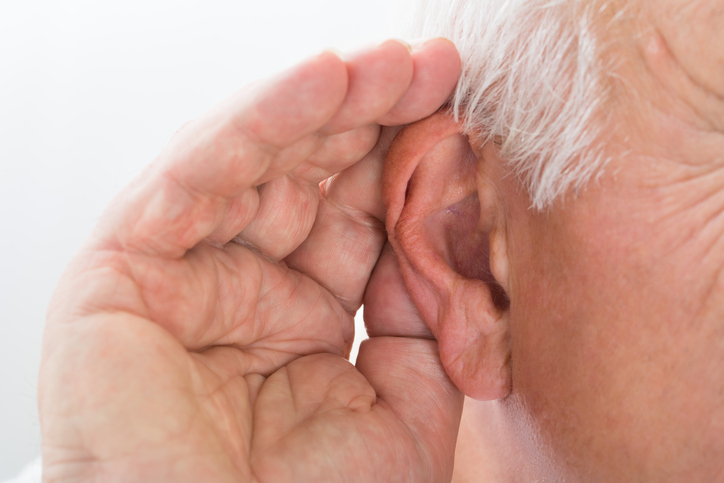 Finally: Hearing aids are an aid not normal hearing, be patient with them. Like anything else everyone is different. We have different hearing losses, different understanding and different way to set their hearing aids. Some people might get a hearing aid and everything is almost as good as normal. Others might have a hard time understanding because they lost the understanding of the English language. There are so many different scenarios that could be another blog. Just remember to be patient and use these communication strategies for the hearing impaired. After all you would be patient with a person that had a visible disability like, being in a wheel chair, prosthetic leg or arm. On a lighter side: Three hearing impaired are out walking. First one says, “Windy, isn’t it?” Second one says, “No, it’s Thursday!” Third one says, “So am I. Let’s go get a beer.” — Rephrase, rephrase, rephrase!